O God, who raised up the Priest Saint Vincent Ferrer to minister by the preaching of the Gospel, grant, we pray, that, when the Judge comes, whom Saint Vincent proclaimed on earth, we may be among those blessed to behold him reigning in heaven. Who lives and reigns with you in the unity of the Holy Spirit, one God, for ever and ever. St. Vincent Ferrer (1350-1419) was born in Valencia, Spain, and died in Vannes, Britany. He was a great scholar and became Master of Theology — he knew the entire Bible by heart. He was also a great preacher, preaching throughout Europe. Jews, infidels and heretics were converted by his sermons on the true faith. The most obdurate sinners embraced a life of holiness. The favorite topic of his sermons was the final judgment. He repeated over and over the words of the prophet, "Arise, ye dead, and come to the judgment." He is often called the "Angel of the Judgment." A renowned wonder-worker, St. Vincent cured the sick, the blind and the lame. St. Vincent Ferrer's father was an Englishman, who had been knighted at the siege of the city. On February 5th, 1367, having completed his studies in philosophy, he became a Dominican. He was moved to Barcelona in the next year, and in 1370 became lecturer in philosophy at the Dominican house in Lerida. In 1373, when he returned to Barcelona to the 'Studium Arabicum et Hebraicum', he was already a famous public preacher. In 1377 he was sent to Toulouse for further study; there he attracted the attention of the Legate of the future Avignon antipope, Cardinal Pedro de Luna, whose suite he joined, being himself a strong advocate of the claims of the Avignon popes as against those of Rome. He preached a great deal, particularly to Jews and Moors, and converted a rabbi of Valladolid, who, later became Bishop Paul of Burgos, and associated with St. Vincent in his strenuous and successful attempts to convert the Jews of Spain. Disillusioned in his attempts to heal the schism between Rome and Avignon, St. Vincent saw a vision of our Lord standing between St. Dominic and St. Francis, commissioning him directly to go about preaching penance. He was released by Benedict XIII in November 1399 to do this, and continued his preaching and wandering throughout western Europe until his death, being followed by a crowd of penitents and flagellants which varied from 300 to 10,000. He was in Aragon when the throne became vacant and with his brother, Boniface, a Carthusian, was instrumental in choosing Ferdinand of Castille as prince. In 1416 he withdrew his own allegiance and that of the kingdom of Aragon from Benedict XIII, because the Avignon antipope had made no serious attempt to heal the schism and had refused the request made by the council of Constance that he should resign in order to make possible a new and undisputed election to the papacy. 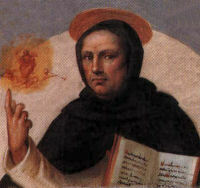 St. Vincent's decision had the effect of deposing Benedict and of making possible an end to the schism. St. Vincent died on April 5th, 1419, at Vannes in Brittany, where his relics are venerated. He was canonized by Pope Calixtus II in 1455. Patron: Brick makers, builders construction workers, pavement workers, plumbers, tile makers. Symbols: Dominican holding an open book while preaching; Dominican with a cardinal's hat; Dominican with wings; cardinal's hat; pulpit; trumpet; Dominican with a crucifix; Dominican preacher with a flame on his head; flame; Dominican preacher with a flame on his hand. St. Vincent reduces the rules of perfection to avoiding three things: first, the exterior distraction of superfluous activities; secondly, all interior secret elation of heart; and thirdly, all immoderate attachment to created things. Also to the practicing of three things: first, the sincere desire of contempt and abjection; secondly, the most affective devotion to Christ crucified; and thirdly, patience in bearing all things for the love of Christ. Examine your own life and consider how well you embrace the desire for perfection. Read St. Vincent's Treatise on the Spiritual Life. Ancient church dedicated to St Eusebius of Vercelli, 4th century bishop. The church was financed by St Eusebius of Bologna, and is first mentioned in 474. This means that it's one of the oldest churches in Rome; it was one of the first parish churches known as the Titulus Eusebi.